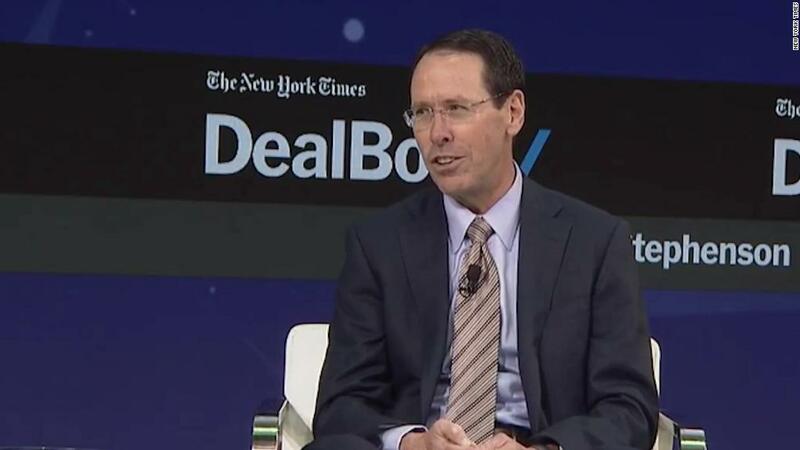 AT&T CEO Randall Stephenson says he is in "advanced stages of negotiations" with the Justice Department. Speaking at the Dealbook conference in New York on Thursday, Stephenson disputed claims that he offered to sell CNN to win government approval of AT&T's pending acquisition of CNN's parent company Time Warner. Stephenson defended the Time Warner deal and said AT&T is continuing to talk with the DOJ "to see if we can get to a negotiated settlement." But AT&T is also getting ready for a possible court battle, he said. If the two sides don't reach an agreement on acceptable conditions or asset sales, the Justice Department will sue to try to block the deal. If that happens, AT&T is expected to fight it in the courts. "We're prepared to litigate now," Stephenson said. He said that AT&T would seek an expedited hearing in that case. The deal, often described as the biggest media merger of the decade, is undergoing a difficult DOJ review. Stephenson said Thursday he has been taken aback by the government's objections to it. "This is a classic vertical merger. There are no overlaps of competition. There are no competitors being taken out of this market," he said. The Justice Department's antitrust division feels differently. The agency's concerns spilled into public view on Wednesday, two days after Stephenson had his first face-to-face meeting with newly installed DOJ antitrust chief Makan Delrahim. At the meeting, Delrahim outlined the DOJ's argument that the acquisition would cause anticompetitive harm to consumers, according to sources on both sides. The two men discussed divestitures that might satisfy the government's concerns. By all accounts, the meeting did not go well. Some sources said Stephenson floated the possibility of selling CNN or other assets. Other sources said the DOJ demanded more -- just not the spinoff of CNN, but the sale of the entire Turner division, which includes CNN, TNT, TBS, and other channels. Another option: selling DirecTV, the satellite broadcaster that AT&T bought two years ago. For AT&T (T), those asset sales are "non-starters," as one source put it. There are two competing narratives taking shape. One version is that the Trump administration is putting consumers first and fighting media consolidation. The other version is that the Trump administration is holding up the deal to punish CNN for its coverage of President Trump. Democratic lawmakers and advocacy groups have been ringing alarm bells about the potential for political interference in what's supposed to be an independent antitrust review of the deal. Some critics of AT&T, like Democratic Senator Al Franken and the public interest group Free Press, reaffirmed their opposition to the deal while also raising concerns about possible meddling. "Any indication that this administration is using its power to weaken media organizations it doesn't like would be a profoundly disturbing development," Franken said. When asked about concerns about Trump meddling in the deal review, Stephenson said "I have no reason to believe that." Delrahim issued a denial on Wednesday night. "I have never been instructed by the White House on this or any other transaction under review by the antitrust division," he said in a statement. Deputy attorney general Rod Rosenstein briefly discussed the matter while addressing a business audience in Maryland on Thursday morning. "We need to make sure we go about it in a serious and nonpolitical way," he said, "to make sure we're making a responsible decision about ensuring there's appropriate competition in the market." He said Delrahim is personally reviewing the AT&T case and "potentially there will be further review within the department." The wireless giant had previously said that it expected the acquisition to take effect by the end of this year. But on Wednesday morning, AT&T said the timing of the deal's closing is now "uncertain." At the conference on Thursday, Stephenson said the company is eager to close soon. Interviewer Andrew Ross Sorkin pointed out that Delrahim has changed his tune about the merger. Shortly after the deal was announced last October, Delrahim said "I don't see this as a major antitrust problem." "He made comments that were exactly in line with what we thought about the transaction going in," Stephenson said. Stephenson's message to the audience of bankers and reporters was that AT&T is committed to getting the deal done, either through negotiations or a court fight. But he hinted that AT&T might seek to buy some other media company if the bid for Time Warner is vanquished. AT&T, he said, would find "another avenue" to "accomplish the same thing," bringing together wireless customers and data with content providers and advertisers.